Steel Doors have a smooth, primed white finish that can be painted to match any décor.They boast high-definition embossments that create shadow lines and provide curb appeal and are well known for their superior insulation value. Their strength will protect your home against extreme weather. Our doors are built to the highest Canadian standards. 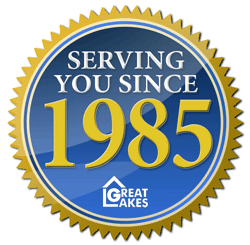 The Great Lakes family has over 25 years of experience in home renovations. With hundreds of choices in colours, styles and accessories, the possibilities are endless. Get a quote for a single door for your home.